Callaway GPSync Golf Watch is a high-performance watch, and it is also very fashionable giving you the freedom to wear it on and off the course. I must admit I have bought and used quite many golf GPS watches over the years. However, I never used most of them beyond a couple of watches. In most cases, the watches end up breaking down or do not leave up to my expectations and so I have to get rid of them. The story has been the same for a couple of years now, but this changed when I discovered the Callaway GPSync Golf Watch recently. When I first bought this watch, I was very skeptical about it as I was almost sure that I will have abandoned it in less than a month. However, once I started using it, I was proven wrong. Unlike the other watches that I had used in the past this watch gave a depth of information that I never expected any golf watch had the capability to give. To cut the long story short my golfing experience was revolutionized and now am always looking forward to the next day out to the course. Besides from the real help that I get from the watch it is also very fashionable, and I wear it almost every single day. Four Golf Screen Modes: This watch has four golf screen modes to ensure maximum effectiveness. The four golf screen modes are Scorecard, Short Distance, Hazards, and Play. Battery: It is fitted with a 220mAh lithium rechargeable battery. The battery has a life of 9 hours or two rounds when used for play and 890 days when used as an ordinary watch. Water Resistant: The watch is 1Atm water resistant. This means that it can be used in wet condition but cannot be used for swimming. Pre-loaded golf course: With more than 30,000 pre-loaded golf courses from across the world the watch can be used from any place on the planet. Scorekeeper: Callaway GPSync Golf Watch has a scorekeeper feature that keeps track of GIR, score and putts per round. Sync feature: It has a sync feature that lets you sync it with your smartphone for email and text alerts or missed call alert. This watch lets you keep track of important statistics when playing golf and hence making sure that you enjoy the game to the fullest. Another benefit is that the data you get from the watch can be used later o when reviewing your performance and hence it will help you determine the areas you need to work on. The Callaway GPSync Golf Watch is very comfortable on the wrist, and you will hardly notice its presence. It is very easy to use and user-friendly. Most users only need a couple of minutes to figure it out. The long battery life means that you do not have to recharge it in between rounds. Accuracy is the biggest advantage with this watch, and it looks like the manufacturer spent a lot of time to ensure that it is as accurate as possible. If you are looking for a trendy or fashionable watch that you can wear on and off the course, then this is a perfect watch for you. Although it is not the most expensive golf watch, it is on the upper end of the scale, and so you should be ready to part with a decent amount of money to get one. The band might have issues when taking off the watch and some customers have complained that the band is also not very durable. Callaway GPSync Golf Watch is a high-performance watch, and it is also very fashionable giving you the freedom to wear it on and off the course. 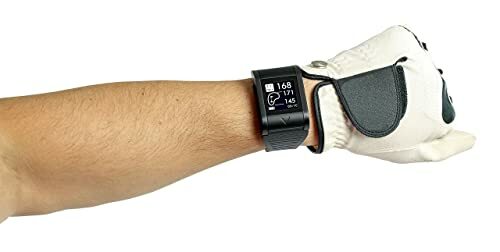 This watch lets you know the distance to the front; center and back with a high level of accuracy hence helping you shoot more greens and avoid penalty strokes. Add this to the many other features and you have yourself a perfect golf watch. 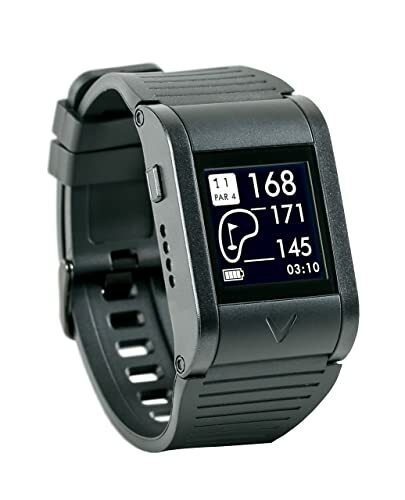 The few shortcomings can easily be overcome, and so I would highly recommend this watch to any golfer.